This off the shoulder dress is perfect for the summer season! I love the button front and ruffle detail along the neckline making the dress fun & flirty! I'm wearing a small, and I'm 5'8 so the length was perfect. I paired this dress with gold/turquoise accents, but yellow goes great with tan, royal blue, white, or even grey! I'm also linking a few identical dress options for $25 and a few similar bag styles that are currently on SALE! 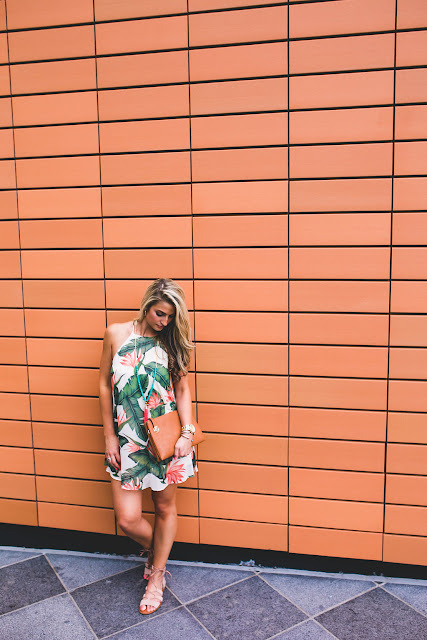 This is one of my favorite vacay looks, the print on this dress just makes me feel like I'm in the middle of the tropics somewhere! 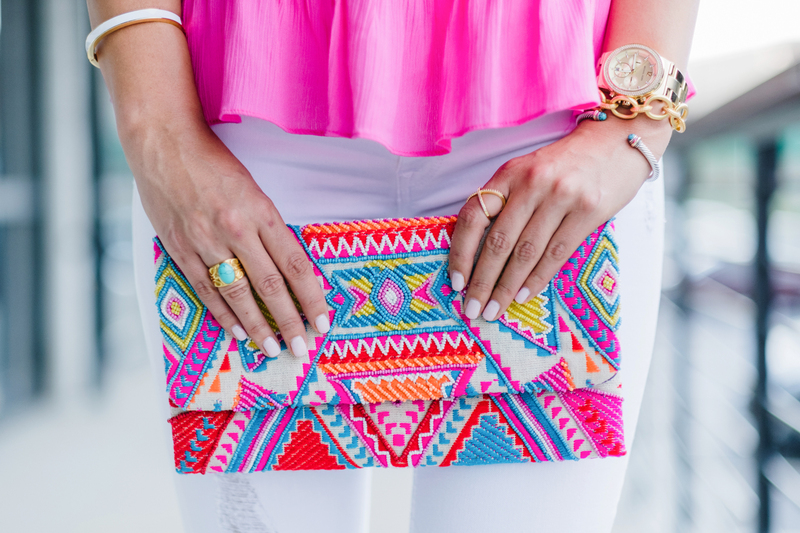 I love feminine and flirty colors, and how do you go wrong with neon pink? 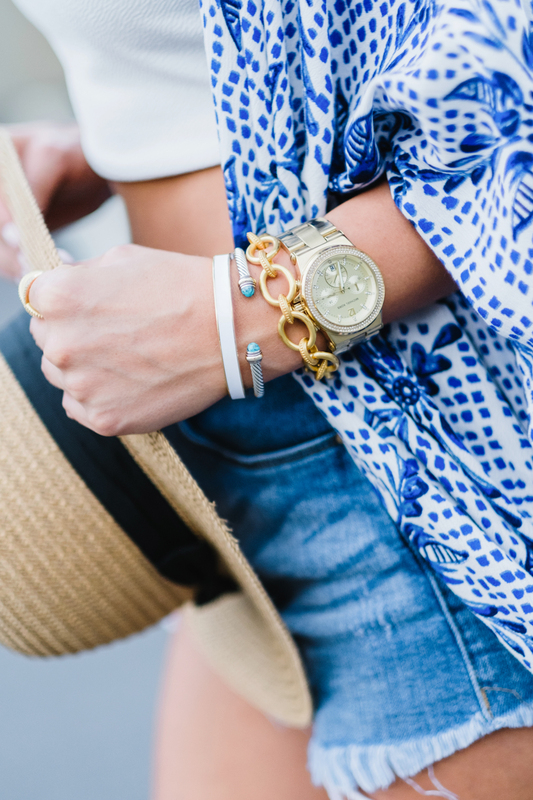 This color pairs perfectly with gold accents, and is sure to enhance the tan you've been working all summer for! Add strappy wedges and a floppy hat, and you're all set for a weekend getaway! We are headed on an island getaway of our own for the 4th of July (and this dress will be in my suitcase)! However, these last few weeks have been so crazy with moving that it doesn't even feel real yet! Can anyone guess where we are going?! With the 4th of July only a week away, I've rounded up some of my favorite USA spirited looks for all American activities! Wether you are planning to be at the beach, the lake, watching fireworks, or a BBQ - there is a look for everyone! 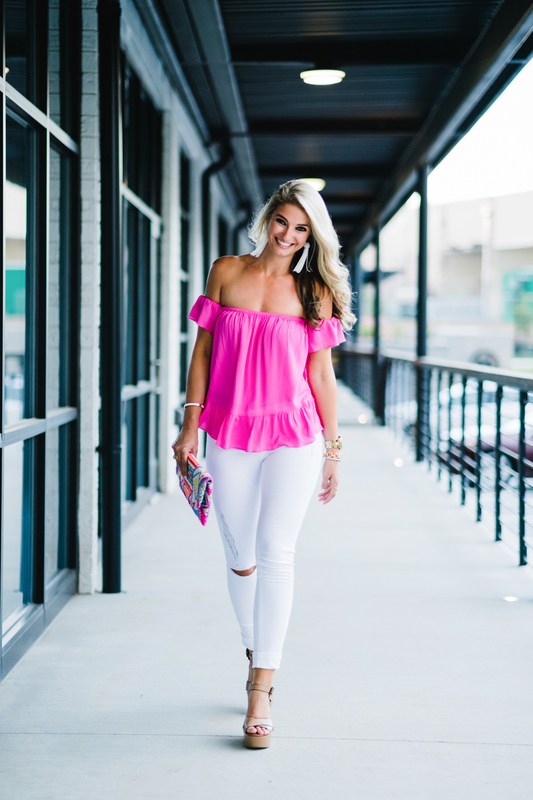 Who doesn't love ruffles + hot pink mid summer? 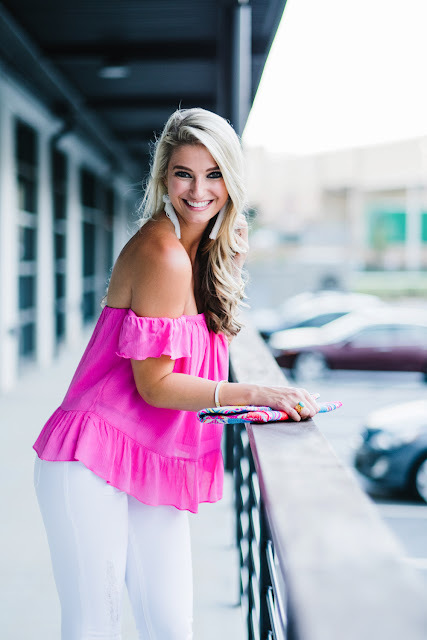 I'm always looking for an easy "go-to" top to pair with distressed jeans, and I have found my match with this one! It also comes in a ton of bright colors, so if pink isn't your thing - there are plenty of options. 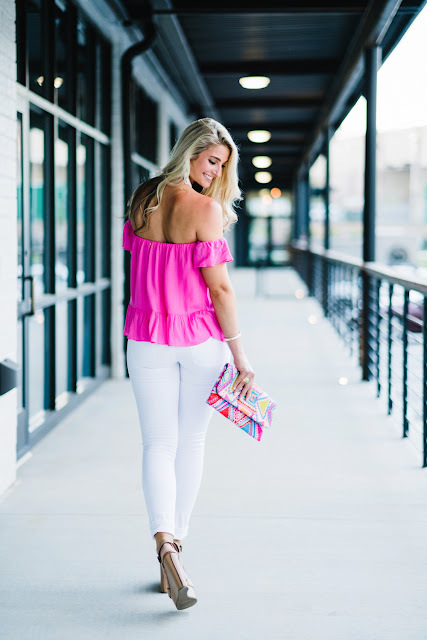 I love that the off the shoulder trend is back (I linked a few options at different price points)! 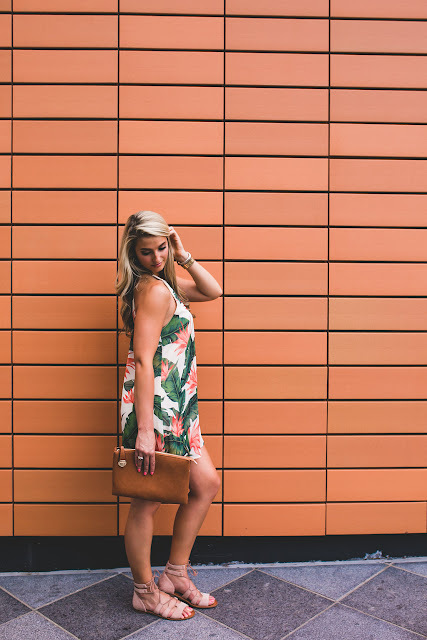 I'm also obsessed with this clutch, however, it's from last season and I can't seem to find it anymore, so I linked a few similar styles. My wedges are probably the most comfortable pair of wedges I own! I walked all over Nashville in them this weekend and they didn't bother me one bit. I can confidently say you'll be seeing them all summer long! Hope everyone had a great weekend! Its that time of year again, weddings galore! We just attended our 4th wedding of 2016 and have 4 more to go. With that being said, cost effective looks are a must! I wore this dress to a wedding in New York a couple weekends ago, and it was a hit! The color looks fantastic on just about everyone (it comes in ivory as well), the lace detailing is feminine & flirty, and it rings in at under $90! I love pairing turquoise with coral, so I chose gold and turquoise accessories and a neutral colored handbag and shoes. I'm also linking a few other options under $100! Greece has always been on my bucket list, although lately my fixation with wanting to go there is becoming a more reoccurring thought. I've spent the majority of my life traveling all over the world due to the line of work my father is in and there is nothing I am more grateful for, than the endless opportunities I had growing up to experience different cultures, foods, landscapes etc. Traveling truly fascinates me, however the real world has settled in and my trips overseas are limited these days. 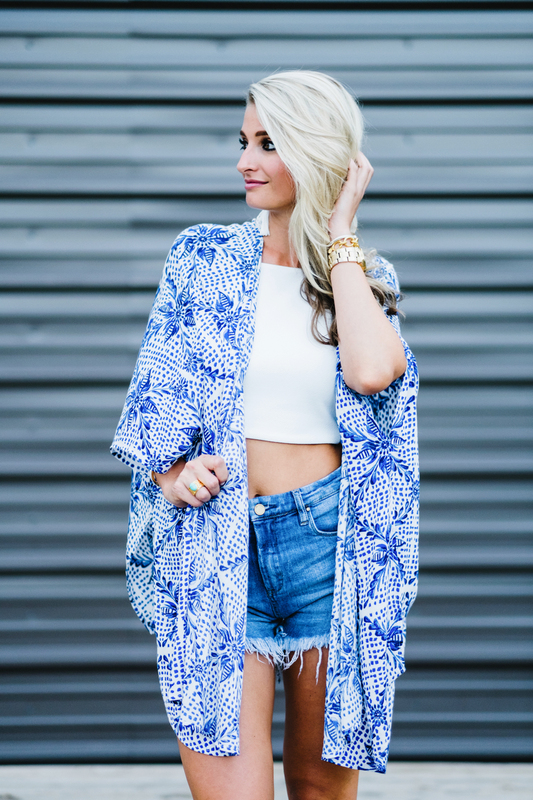 So for now, this amazing Kimono will be bringing the Greek isles to me! The Bali Kimono is just right for those crazy days that start off cool, and end a hot sweaty mess! It's lightweight, so it's easy to peel off & throw into your bag as you go. Not to mention, this thing has got to be wrinkle proof! I had it stuffed in the bottom of my bag when traveling around Mexico for hours and it came out looking just like it did off the hanger - amaze. The colors are exactly as pictured, deep blue & bright white and it pairs perfectly with a crop top & distressed shorts, a simple white dress, over a romper, or over a white cami & distressed jeans. So versatile, you can't go wrong with it! I've also linked a fewer similar options at better price points. I hope everyone has a great Monday! 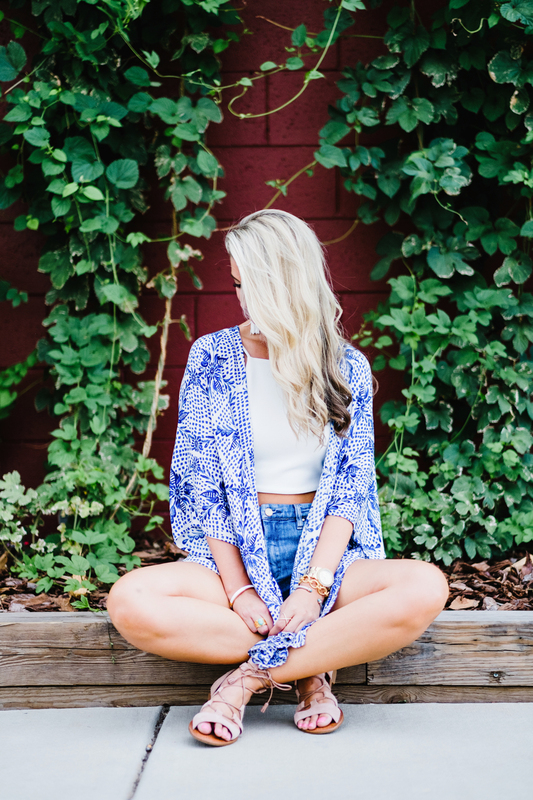 It's safe to say I have a slight obsession with Show Me Your Mumu! Okay, slight might be a big understatement - I have a huge obsession with their brand. 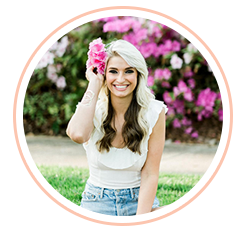 They have created the perfect combination of flattering & girly in a boho chic world! Enough to make you wish you either lived in SoCal or have an endless slew of tropical vacations to attend this summer. Not to mention, all of their clothes are made in the USA! So needless to say, you'll be seeing a lot of that on this page. I recently purchased their Gomez Mini Dress in the Paradise Found print & cannot wait to wear it on our next vacation! I love the high-neck on it, the fabric is comfy and flows perfectly and the print is just awesome. However, I am 5'8 and if I were an inch taller the small would be just a tad too short. I almost always wear a small in all of their clothing and the length is usually ideal, but this one runs just a bit shorter. 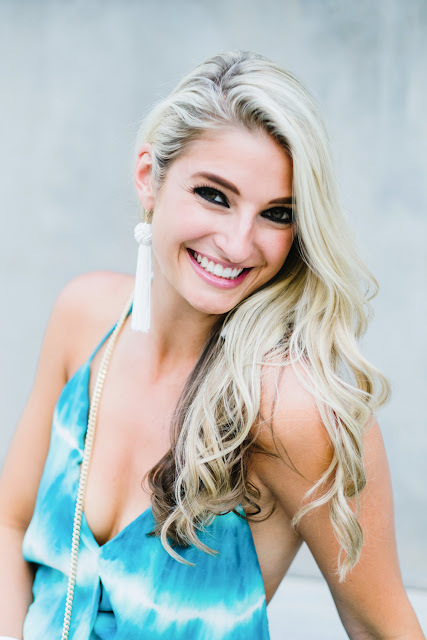 I paired the dress with one of my favorite BPD (Betsy Pittard Designs) necklaces to give just a pop of extra color to the outfit! BPD has some really cool statement pieces at reasonable prices, and they are just an awesome company in general. I've linked my entire outfit & a few similar items that I like! Happy Sunday, fam! Happy FriYAY, friends! I wore this on a trip to Mexico recently and am completely obsessed with it! It's the perfect maxi for a beach vacation, dinner date, summer concert, BBQ or just to run errands in! It's super light-weight, soft, and has a really cute "T" back as well. Not to mention, it's currently on SALE here! I'm also linking a few other favorites here, here, and here (I have this too)! I hope everyone has a great weekend! Shane and I are closing on our first home this weekend - big things to come!